Whiskey 101: We sip it slowly, we mix it into cocktails, some of us toss it back, and some of us don’t go near the stuff. But if you’re down with that cold hard brown, then you may not realize the scientific miracle that resides in your glass. The Crafty Cask is here to give you a simple rundown of how it comes to be with this brief introduction we call Whiskey 101. For the purposes of this article, whiskey will become an umbrella term for bourbon, scotch, rye, single malt, and blended varieties. Rest assured there is a huge difference between all of them, but that’s for another article. 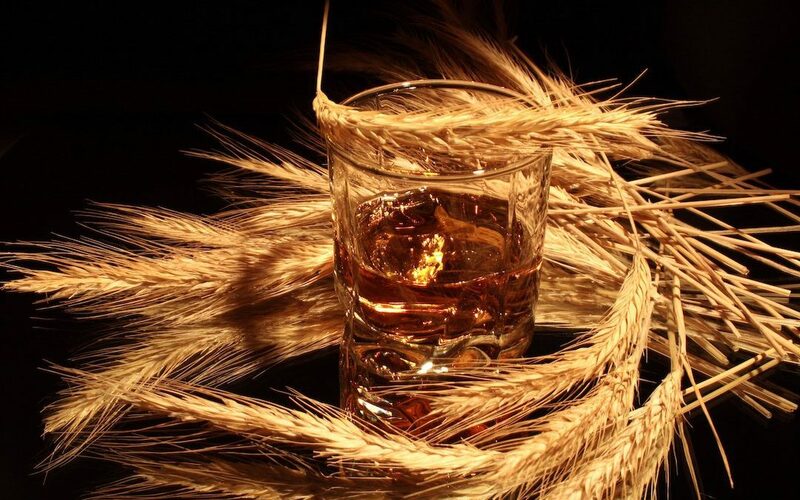 Some whiskies are made from barley, rye, wheat, others corn, and many can be a mix. Whiskey can also be categorized by place. Scotch, for example, comes from Scotland while Kentucky Bourbon comes from Kentucky. Place also determines the spelling of whisk(e)y…with or without an e. A helpful and relatively reliable rule of thumb is, if the country of origin has an e in it, so does the whiskey. So you guessed it, Canadian and Japanese Whisky, not Whiskey. American and Irish (Ireland) Whiskey. For simplicity sake, and since we’re writing in AmErica, we’ll use whiskey from here forward! Yup, there’s a lot of information to unpack within our whiskey 101 class…so let’s get started. Wheat – grain that has a bread-y and sometimes honey note to it. While straight wheat whiskies are becoming more popular you often see wheat as one in a mix of grains. Once a distillery has their grain or mix of grains (known as the mash bill), the next challenge is malting the grain, usually barley. Or, for most producers, buying malted barley from a malt house. The malting process starts by steeping barley in water. Germination then begins to occur, which encourages the grains to convert starch into sugar. In the last stage of malting, the germinated grains are put into a kiln. Depending on the desired flavor profile, the temperature and time in the kiln can vary. This is also the stage where peat, which is a brown soil-like material, may be added if it’s being used. Peat will only be added to the kiln if the producer is looking to impart that peaty characteristic that is so loved (and hated!) in peated scotch. Yeast is a key component to the production of alcohol. 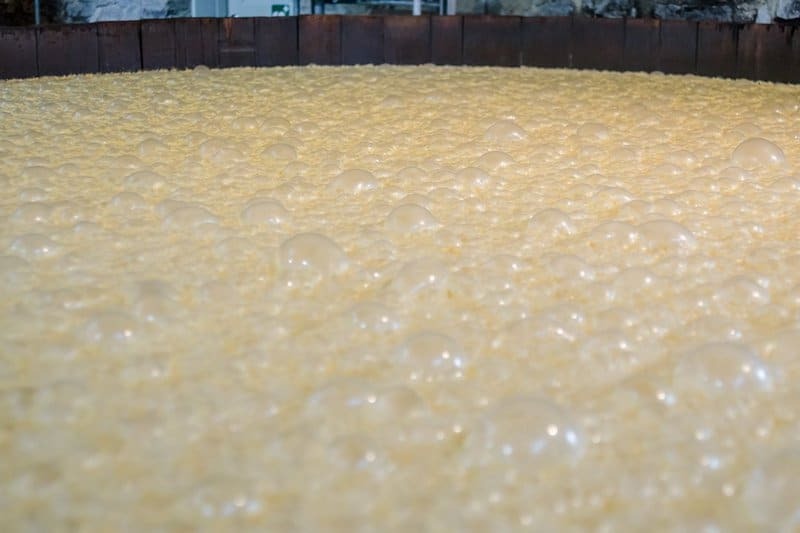 It does something truly incredible…it converts sugar into alcohol! Yeast is a fungus, that can live almost anywhere. These single-celled organisms live in the air and environment around you. When people talk about native or wild fermentation, that’s what they’re using. However, yeast can also be purchased as a liquid or as a dry powder as well. Yeast eats sugar and converts it into alcohol. This, my friends, is the process of fermentation. Fermentation can take 48 hours or longer depending on the desired product. Fermentation and yeast, although instrumental in making alcohol, have at this point only yielded a concoction that is usually only 5-10% alcohol by volume. This product, called a wash, is also…wait for it…technically a beer! The beer doesn’t taste all that great at this stage, but it is in fact a beer. This is when distillation comes in and steals the show, turning that beer into a whiskey by condensing the liquid to achieve a much higher alcohol by volume. Hopefully, you are still keeping up as we approach another essential act – distillation, or the separation of different chemicals in the wash according to their boiling points. The wash, is poured into a still and heated so that the vapors rise up through metal plates. The boiling point that must occur for alcohol/ethanol to vaporize is 173 degrees Fahrenheit. The vapors are then cooled and sent down another chamber to begin capturing the liquid (click here for a refresher on the different stages of this process – foreshots, heads, hearts and tails) that ultimately becomes the whiskey we all know and love. Although this is a pivotal part of the process we are not at the bar yet folks, for we must now age our liquid gold to develop the final flavor and color we’re looking to create. Whiskey woodn’t have the flavors we have grown to admire if it weren’t for wood (little word play there if you caught it!). Jokes aside it is a major step in the process to deliver what you enjoy in your glass. In a sense, the wood “breathes”, sucking some of the liquid in at certain temperatures as the wood expands and then pushing it back out as the wood contracts. Unlike with wine, where you only want a kiss of oak, more extreme temperature fluctuations are actually good in whiskey barrel rooms. It forces more of that “breathing” and therefore imparts more flavor. Understanding and leveraging this is truly the art of whiskey making. That deep caramel flavor? The hint of vanilla? The aging process can get a big thanks for that…and the richness of color too! 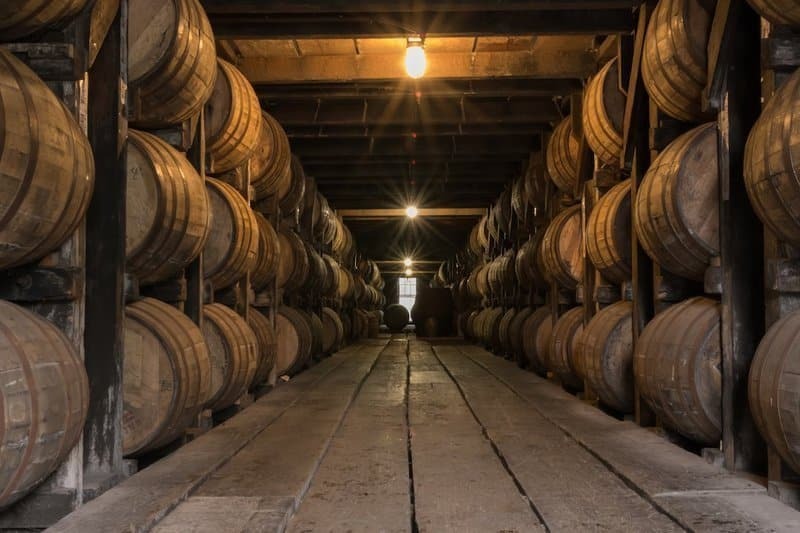 Traditionally aging can take years, but for some small distilleries looking to produce faster the usual 52-gallon barrel is simply too large and slow. Enter the new age of smaller barrel aging. New and innovative producers, like Seven Stills in San Francisco, are using 5-gallon barrels in order to age faster, while still maintaining the dedication to their desired flavor profile. The science behind this practice is simple – a small barrel creates a higher wood surface-area-to-whiskey ratio. There are other innovative explorations in this space as well, with some distilleries chopping up barrels and soaking them in the whiskey in an almost pressure cooker-like fashion. While the jury is still out on some of these newer approaches, the outcome is whiskey that makes it into your glass faster, although perhaps at a cost. Ah, the miracle of whiskey! It’s not just a drink in hand, but an art and science in practice. Hopefully, we’ve enlightened you to the point of exploration. Especially when it comes to trying out what local distilleries have to offer. For example, the small barrel practice mentioned above? That produces some of our favorite craft whiskey around, which you can read all about in our next article. Whether you’re visiting a local craft producer or you’re purchasing a craft whiskey at your favorite bottle shop…tell us about some of your favorite finds and styles. What makes them unique? Why do you love them? And, of course, take a minute to consider the long and thoughtful journey your whiskey has taken in order to become the delicious sip you are about to enjoy.